Do as the Spanish do! 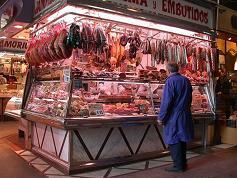 With this guide to Madrid shops the maze that is shopping in a foreign city is unravelled. Experience the best of shopping in Spain and shop as the Spanish do! Of course we also include where you can find these shops as well as indicative opening times! Due to the Heat in the middle of the day Madrid shops tend to close for the mid afternoon when the sun is at its strongest. Although the larger stores and Supermarkets have now abandoned this practice small independent family businesses continue to do so. When the Madrid shops are closed on Sunday you have the perfect reason to visit El Rastro market! The principal areas for Clothing are in Goya and on Gran Via as well as in the commercial centres. Both these areas are close to the centre of the city and well conected by Metro & Bus services. ZARA - Both smart and casual clothing for all ages. Very similar to GAP in the USA or NEXT in the UK. H&M - A cheaper version ZARA catering more to casual wear. C&A - Smart / Formal clothing for both sexes and children. BERKSHA - Ladies fashion store with some formal items. Adolpho Dominguez - Upmarket formal and casual wear for men. These Spanish stores can be found mixed in with such international names as Timberland, Tommy Hilfieger, Springfield, Benetton & Nike. 24hr - Formal and casual shoes for both sexes these come with a unique ventilation system built into the soles. Supplying air directly to the feet, the more you walk the cooler your feet become. In madrid there is only one chain of Department store in the USA model: El Corte Ingles. Thankfully the city has over twenty of them including in the city centre. In these stores you can purchase just about everything you might need from food to travel. Whilst you might not want to try and take a new fridge or washing machine through the airport the small things like Batteries or Camera memory cards are always needed. Madrids many electrical shops stock these and other essentials. Plug adaptors are also available in these stores. Madrids electrical shops can be broadly divided into two categories Large domestic items (TV, Fridge etc) and the smaller handyman type store stocking everything from Lightbulbs to Irons. The former will be titled "Electrodomestico" and the latter "Ferreteria". Depending on your need be sure to ask for the correct store type as there is not much in the way of product overlap. Despite 99% of all travel planning now being possible over the internet there are still times that a Travel agent is needed. Be it to collect a plane ticket, reserve a hotel in another city or simply to compare prices. One of the beauties of Madrid shops is the fact independent stores flourish and competiotion is fierce. This helps keep quality high and prices reasonable. Click here to explore other shopping options in Madrid!